Scientists and inventors have been working overtime recently to come up with brilliant ways to improve the lives of the visually impaired. The most recent development would allow the blind to navigate city streets with the help of haptic device embedded in a pair of shoes. Haptic technology uses tactile feedback such as vibration, force, or motion to communicate via the user's sense of touch. The technology has been around for years; you've probably encountered it in game controllers that vibrate in response to activity in the game. Researcher Anirudh Sharma of Hewlett-Packard Labs in Bangalore, India, used haptic technology in a design he called Le Chal, Hindi for "Take me there." The system includes four small vibrators in the front, back, and sides of the shoe, connected to a LilyPad Arduino microcontroller in the heel. Using the shoes is simple. The user speaks their destination into a GPS-enabled Android smartphone, and the phone uses Bluetooth technology to communicate with the shoe. The shoe then assists the user by indicating upcoming turns and routes by vibrating different parts of the shoe — on the left side to turn left, in the rear to stop, and so forth. 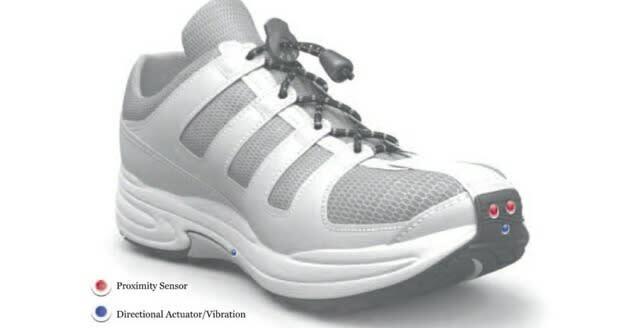 There's also a proximity sensor in the front of the shoe that alerts the user to obstacles in their path. Sadly, there are no plans currently to produce and market the Le Chal shoes, but Sharma does plan to release the design schematics and code for the shoes via the Arduino community so users can build their own and even improve on the design.